Mark Roberts Limited Edition Birthday Collection. Size: 9 inch. 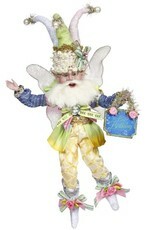 Mark Roberts Fairies Limited Edition Flexible and Pose-able Fairy Doll Collectible. Happy Birthday Party Themed Decorations, Decor and Gifts.